Drizzle the oil on a rimmed baking sheet. Arrange the sliced potatoes cut side up. Bake for 35 minutes, until the flesh can be pierced with a knife. Remove from oven and let cool until you can manage them with your hands. While they cool, heat a medium skillet over medium high. Add the ground turkey and cook until browned, 6 minutes. Add the chopped chiles and taco seasoning and toss to combine. Using a melon baller, scoop out as much potato flesh as you can. Discard or save for another use. Evenly spoon the turkey mixture into each cup. Top with shredded cheese and throw back under the broiler until the cheese is browned and bubbly, 2 minutes at most. 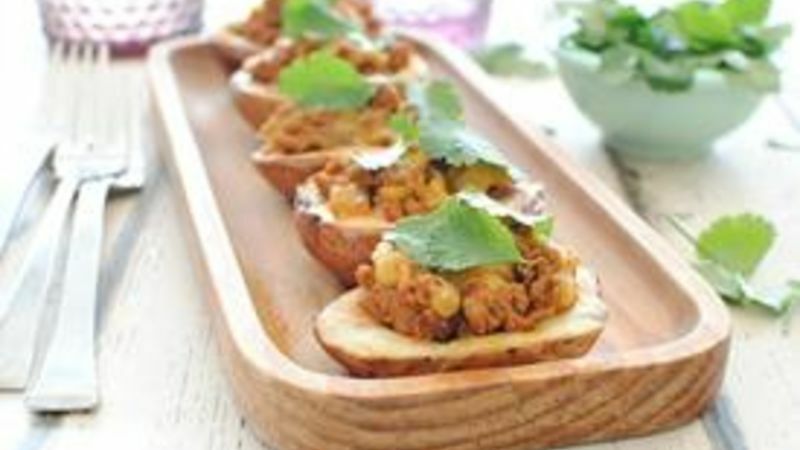 Serve potato bites garnished with cilantro! And it's weird and strange and completely unexpected and crazily out of character for me but I just can't help it. I WANT to hate it. I wish I could stop it. But I tell you, it slips more and more out of my control as each year passes. I really enjoy college basketball. I either just gained 473 new male readers or you're all experiencing my very fun version of SHOCK THERAPY. It all started 5 years ago when we moved from our urban downtown KC loft to our quaint, cozy, little purchased ranch house just a kiss into Kansas. I didn't give 2 you-know-whats about sports until Aaron said to me one day, "You know, now that we live in Kansas we have to root for the KU Jayhawks." Me, "The KU whuwhuz?" Him, "The Jayhawks. They're like, insanely good. One of the best teams in the country. Next time there's a b-ball game on, we should watch." Right, sure, UH HUH. And ew, don't call it "b-ball." And just like that my inner basketball maniac was released upon the world. I'M INSANE. I jump up and down. I sweat. I do the pee pee dance. I scream "NOOOOOOOOOO!!!!!!!!!!" in a voice that embarrasses even Marlon Brando. Seriously, WHO AM I?! How did this happen? Will it ever go away? Help me? So, obviously when March Madness rolls around life stops and nothing else matters, and these games are the only things that exist and I'm totally freaking you out right now. The entire point of what I'm trying to tell you is this. These turkey potato taco bites are so stinkin' delicious you're going to want to…wait for it….SLAM DUNK them into your mouth! OHHHHH I'm so fired. Fo' real though. Make these for your next March Madness party. Or if b-ball (omg I just did it) ain't ya thang, then just make them for breakfast, lunch, snack time, dinner and/or dessert. But if you make them for a March Madness party, invite me over! Wait, don't. I'll annoy the daylights out of you. Look how simple this is! We got taters, cheese, turkey, Old El Paso chiles and taco seasoning, and cilantro. Das it. Slice the potatoes in half lengthwise and arrange them on a baking sheet with a little oil. Lick one. I'm JOKING. While they bake, get your little filling all ready. Brown some turkey. Add the seasoning. It's already smelling so, so good. Mix it all together like birds of a feather. Or something. Using a melon baller or small spoon, scoop out as much potato flesh as you can, without ripping the skin on the bottom. I ripped the skin on two of them. But I held it together and moved on with life. And I apologize about the word "flesh." Fill up your little potato cups with the filling! Taste the filling. AH KNOW. And of course, sprinkle with delicious cheddar. Stick them back under the broiler until that cheese gets nice and bubbly, for the love. March maaaaadnessssss snacks up in HEE-ER. Don't you want 6,000? I do. And I did. And I do again. *Bev hopes that she didn’t offend anyone with her love for the Jayhawks. These things just aren't in her control. For more musings, visit her blog Bev Cooks and her Tablespoon profile.